Neoliberalism, the current predominant economic policy globally, promotes policies such as privatization, deregulation, austerity and free trade. This study is an exploration into the current politicization of commodification through our current neoliberal economic climate; speculating a future world where the very air you breathe is packaged. This paper will explore speculative design, in the context of neoliberalism, to demonstrate how air could be marketed in the same way that water, which should be freely available to all, now has a price tag. Speculative design, as described by Dunne & Raby (2013) ‘thrives on imagination and aims to open up new perspectives on what are sometimes called wicked problems, to create spaces for discussion and debate about alternative ways of being, and to inspire and encourage people’s imaginations to flow freely. Design speculations can act as a catalyst for collectively redefining our relationship to reality’ (2013). If we compare speculative design to science fiction, it is through speculative design, or design fiction, that we can explore current social challenges, ‘to better understand the present and to discuss the kind of future people want’ (Dunne and Raby, 2013). It is to ‘combine informed, hypothetical extrapolations of an emerging technology’s development with a deep consideration of the cultural landscape into which it might be deployed, to speculate on future products, systems and services’ (Loiseau, 2013). Whilst speculative design deals largely with propositions for the future, the premise of design fiction is not to predict the future but rather to envisage possible futures through which we can spark debate and discussions. Dunne & Raby note that speculative design is ‘by necessity provocative, intentionally simplified, and fictional’ (2013). The value in this is that through speculation we can aim to achieve a better understanding of the potential implications of our actions and emerging technologies in various contexts, with the hopes of informing our decisions from the genesis, ‘to open up all sorts of possibilities that can be discussed, debated, and used to collectively define a preferable future for a given group of people’ (Dunne and Raby, 2013). An example of this can be seen in Budinas’ Air shield designed to cover babies in their strollers whilst outside in the ‘fresh air’ of the garden (Budinas, 2015). Seeing an infant lying in a pram in a lush garden but covered in an artificial shield ‘for protection’ is a provocative and disturbing image designed to evoke shock and stimulate discussion. Speculative design positions itself between ‘the probable’ and ‘the plausible’, but needs to be contextualized by our past and present. In 1989 the conservative government, under Margaret Thatcher’s free-market regime, sold state government water supply to private utility companies. This could be argued to be the beginning of the ‘privatisation boom, which was copied around the world’ (Freud, cited in Osborne 2017). Privatisation, a key feature of neoliberalism, therefore facilitated private individuals to own and thereby control the supply of access to a basic human right – in this case, water. At the time Perrier was the leading bottled water manufacturer but Nestle and Danone saw that this previously niche market was rich for profiteering. The pitch was not simply to make bottled water an acceptable concept but rather an essential product, thus turning water, a basic right into a marketable commodity.‘Bottled water sits at the intersection of debates regarding the social and environmental effects of the commodification of nature and the ways neoliberal globalization alters the provision of public services’ (Jaffee, 2013). Additionally, whilst Swyngedouw (2015) argues that “Nature itself has long resisted commodification”, he also admits that in recent years, nature and its waters have become an increasingly vital component in the relentless quest of capital for new sources of accumulation.” Thus, the privatization of drinking water can be understood as one facet of a much broader, ongoing process of commodification of nature, linked to the strategies of global capital firms to ensure continued accumulation (Jaffee & Newman, 2013). Unfortunately for Perrier, in 1990 they had to ‘[recall] it’s entire inventory of Perrier from store shelves after tests showed the presence of the chemical benzene in a small sample of bottles (James, 1990). Benzene, being a human carcinogen, was found at above the WHO levels resulting for the recall to total 6 weeks. While Perrier were in a state of crisis, Highland Spring exploited the disaster by using the empty shelves to push for their carbonated water to reach the top of the market in the absence of a competitor. Paralleling this exploitation of crises, wealthy investors are buying up lakes and reservoirs as they are able to foresee the future global water shortage crisis and thus plan to capitalise on the commodification by making a huge profit– imitating Highland Spring’s strategy but on a global scale. Neoliberal ideology supports the idea of the free market where supply is relative to demand but, according to Dr Gieick, ‘demand is manufactured’ by businesses and so the ‘free market’ is anything but free: it is controlled by those with the money and power to do so (Foods that make billions – Liquid Gold BBC, 2017). Another example of this happened in the early 2000s when there was an ‘epidemic’ of bird flu cases reported at the same time as a huge demand for the vaccination against it: critics pointed to the fact that there were large stockpiles of this vaccination that needed to be sold before the expiry date and it was mooted in the press that perhaps the scale of the outbreak was exaggerated so that demand for the vaccine met the supply availability: thus demand was manufactured. While Willem Buiter, global chief economist at Citigroup, writes that ‘water as an asset class will... become the single most important physical commodity, dwarfing oil, copper, agricultural commodities and precious metals within 25 to 30 years’ (cited in Alloway, 2009) I can foresee an alternative to water which is receiving far less recognition as a global crisis – air. As industrialisation continues, urban air pollution progressively and rapidly gets worse and worse, meanwhile, global greenhouse gas emissions continue to rise, a report from OECD (Organisation for Economic Cooperation and Development) says ‘pollution will become biggest cause of premature death, killing an estimated 3.6 million people a year by 2050’ (Love, 2012). A study conducted by Segei Petrovskii, an Applied mathematics professor at the University of Leicester, has revealed that ‘by 2100, the earth at sea level could have atmospheric oxygen levels comparable to the top of Mount Everest today’ as a direct result of polluting greenhouse gas emissions. ‘Marine plants such as phytoplankton are estimated to produce more than half the Earth’s atmospheric oxygen… if the worlds oceans warmed by 6 degrees Celsius – a realistic possibility if global emissions continue unabated – the tiny plants would halt oxygen production (Hill, 2015). We only need to observe the historic examples of how water was privatized into a commodity to assume that in the not-so-distant future as our natural, clean air resources slowly deplete, it could become the next global monopolized commodity. Recently, a cricket match in Delhi was stopped due to the heavily polluted air. ‘The fast bowler Suranga Lakmal was seen doubled over and retching on Tuesday afternoon as levels of the most harmful pollutants hovered at about 300 micrograms per cubic metre in parts of the Indian capital – 12 times the World Health Organisation safe limit’ (Safi, 2017). The pollution caused Lakmal to ‘continuously vomit’ and he had no choice but to play wearing a pollution mask. The Hindustan Times reports ‘Delhi’s pollution levels worse than the great London smog of 1952’, considered one of Britain’s worst environmental disasters (Pillai, 2016). Currently in California, firefighters are tirelessly fighting The Thomas Fire’ which ‘exploded from a brush fire to a raging inferno’, now larger than all of New York City (Yann, 2017). State agencies have issued air quality alerts as the smoke, ‘a mixture of carbon monoxide, volatile organic carbon and particles that include alkaline ash, black carbon and organic carbon’ pollute the air (CBS News, 2017). Due to the unhealthy air conditions, free N-95 masks were handed out as the air index was classed as ‘hazardous’. Sadly, ‘in locations like Mumbai and Beijing, high pollution concentrations are sustained across the entire region for days or even weeks; there is no practical escape. Californians are experiencing what it’s like to live in a developing country without strong air pollution controls (CBS, 2017). The Weekly World News, a satirical newspaper, proposes the answer to the diminishing resources of clean air is to tax it, ‘that’s the only way to ensure that people are not breathing more than their fair share’ (Lake, 2017). Where the Weekly World News stems from a purely provocative and fictional standpoint, the reality of satire is that it is ‘the use of humour, irony, exaggeration, or ridicule to expose and criticize people's stupidity or vices, particularly in the context of contemporary politics and other topical issues’ as described by the Oxford Dictionary. Topics discussed through satire are, by design, never too far from the truth and, in fact, are an extremely effective tool in exploring often otherwise challenging or controversial subject matters. It would appear as though some people have already recognised that air as a commodity is and will be a growing market in the near future. A British firm called Aathear, set up by Leo De Watts, initially started out as a tongue-in-cheek “enviro-political artwork” to comment on the global pollution situation by ‘farming’ air and collecting it in jars. These jars were then sold online to China so they can experience the fresh air of England. It soon became apparent that there actually was a market for it bottled air having sold 180 580ml jars at £80 a piece. What was initially a way of helping people ‘comprehend the scale of global air pollution’ has become a viable business venture. ‘The money earned from the jars of air is reinvested to create cheaper breathing masks’ (Barhat, 2017). De Watts responds to critics who claim he is ‘cheating people out of their hard earned cash’ by stating, ‘At the end of the day, we are a company selling fresh air to people who can afford it, and anti-pollution facemasks to those who can’t’. Whilst De Watt may seemingly claim to have good intentions, there is definitely an element of neoliberalism at play here through capitalising on air as a private commodity whilst demonstrating the potentially damaging notion that eventually only the wealthy will be able to afford clean air. Paralleling De Watt’s business is Vitality, ‘a company based in Edmonton, Alberta, which collects air from the Canadian Rockies and compresses it into containers.’ (Barhat, 2017). Moses Lam, the chief executive at Vitality, explains that they now sell ‘10,000 bottles a month’ to their target markets of ‘places choked with polluted air, and where many people actually pass away prematurely due to pollution.’ The air is sold in single eight-litre compressed bottles, each holding around 160 breaths and costs $24 per bottle. Lam comments, “For us, it is definitely a legitimate business. We will be the next bottled water”, scarily reiterating the notion that clean air is due to follow in the footsteps of water. Unfortunately, ‘scientists say there is no evidence or research which shows the upside of bottled air’ and that there is currently no proof that they provide any health benefits. Finally, another way in which businesses are capitalising on this global emergency is through designer face-masks. We have seen the importance of respiratory masks in use in the Sri Lanka-India cricket test, California’s distribution of N-95 masks and De Watt’s investment into cheaper breathing masks, however a new demand for ‘designer masks’ is beginning to grow. Swedish entrepreneurs Kempe & Hjerström’s company, Airinum, sells designer-masks in a range of colours and patterns for between $66 and $77. Likewise, ‘start-ups like Idealist Innovations in China, Vogmask in the US and Freka in the UK, offer trendy pollution masks for between $33 and $100’ (BBC, 2017). Barratt, senior lecturer in air quality science at Kings College London, is still suspicious of these designer products, stating that ‘masks would have to be worn for very long periods to have a bi impact on the chronic effects of air pollution.’ The BBC reports that ‘companies like Airinum are trying to reinvent the face mask as a stylish accessory’, further conditioning the public to believe that not only are they a necessity but they should be paying more for fashion as well as function, sophisticated marketing of the product by creating a demand for it targeted at different income levels. Air quality is, like water, a basic human right; we should not need a mask to gain access to that element of Nature. This is neoliberalism at its ‘finest’. Consider the scene: Imagine it is the year 2100. Blurry-eyed you walk to your bedroom mirror, a mask consuming the lower portion of your face. As you get ready for work you clock watch, any extra breaths will cost you: air is money. Work is a solemn place: laughter costs air units. A sobering thought. This is how I imagine what lies ahead of us. It seems a plausible neoliberalist reality that we may see the ultimate privatisation and commodification of clean air; private corporations would buy large silos of air and government tax would be applied to every single breath. People would be obligated to wear respiratory air purifying masks as a result of the ever increasing, dangerous, air pollution levels. Governments and corporations globally would do battle for control over the air as a marketable commodity, the poorer nations restricted to rationed access or staggered levels of quality of air with First, Business and Economy class air grades. Pollution, levels, ironically, would not be monitored since it would be in the interests of the ‘owners’ to perpetuate the demand for clean air by allowing polluted air to be the norm. Air would be taxed with meters on each individual mask logging the user’s daily intake. To conclude this study, I would like to propose some questions that through speculative design and design fiction we may perchance be able to suggest some plausible possibilities with the hope of being able to prepare and equip ourselves for our future environmental context. If the era of Neoliberalism perpetuates, what would the price of air be relative to, who would decide this and how would we ensure access to every income level? How would we accommodate the sick, the elderly and children? What about smokers – would they be surcharged for access to special filters? Jogging and outdoor pursuits would become less prevalent and the search for greater efficiency in O2 use might help spawn a new exercise class to replace Zumba: Breathe! Can we envision a world where going outside actually generates a government health warning as we have now on the side of cigarette packets: breathing can damage your health! Remarkably, bottled water is ubiquitous; air in a jar is perhaps simply an inevitable progression from that successful commodification of necessity of life. Dunne, A & Raby F (2013) Speculative Everything: Design, Fiction and Social Dreaming. London: The MIT Press. 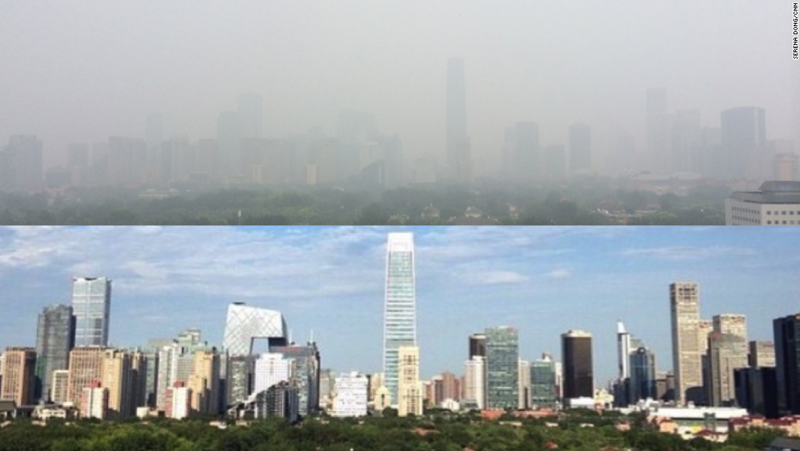 Larsen, C. (2014) How did Beijing achieve “APEC blue”?Retrieved from Bloomberg. Swyngedou, E. (2015) Liquid Power: Contested Hydro-Modernities in Twentieth-Century Spain. London: The MIT Press.